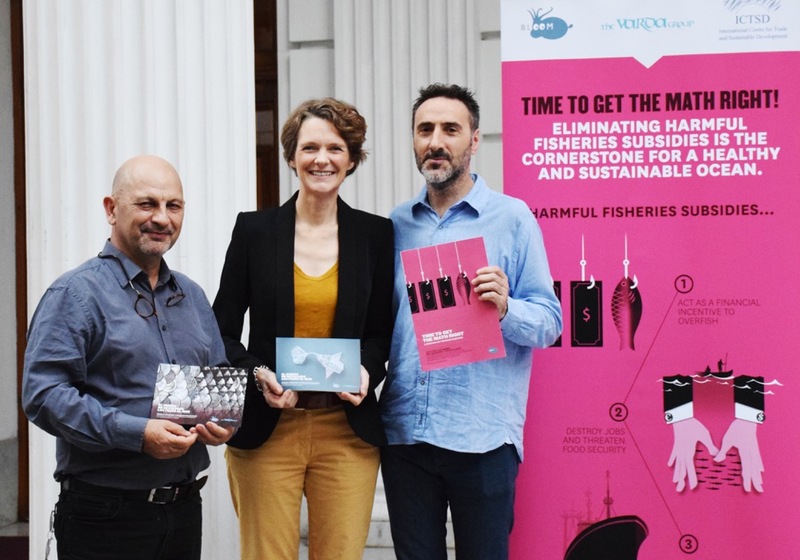 BLOOM has joined forces with the Varda Group with the objective to end harmful fisheries subsidies through an international, legally-binding agreement at the World Trade Organization. In the run up to the WTO’s 11th Ministerial Conference in December 2017 in Buenos Aires, we advocated for the elimination of harmful subsidies, at least those encouraging illegal fishing, and for increased transparency requirements. While nations failed to agree on common language, Trade Ministers did agree to formally adopt a WTO declaration by which they commit to adopting a legally-binding agreement by the next WTO Ministerial Conference, at the end of 2019. Below you will find the main steps our campaign has taken to push for the implementation of Sustainable Development Goal #14.6. BLOOM has participated in the first High level UN Ocean Conference convened by the General Assembly, to support a crucial point of the agenda: the elimination of harmful fisheries subsidies. From the UN Ocean Conference, BLOOM welcomed the political declaration “Our Ocean, Our Future“, by which governments agree to eliminate harmful fisheries subsidies “including through accelerating work to complete negotiations at the World Trade Organization on this issue”. 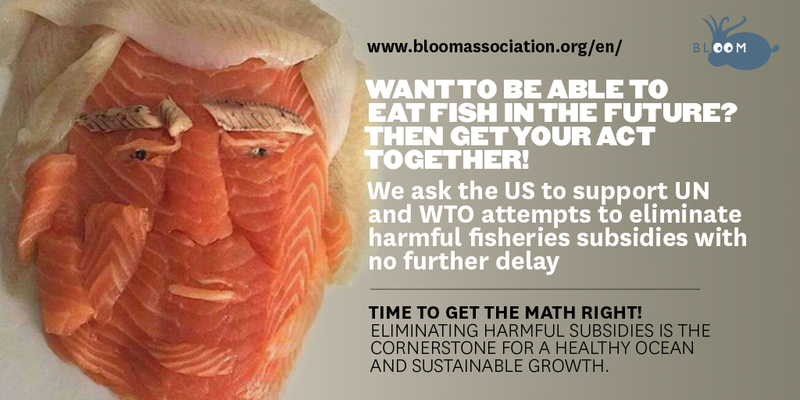 BLOOM and the Varda Group urge all WTO members to reach in the next three months, on time for the Buenos Aires conference, a strong agreement that will provide the framework to eliminate harmful fisheries subsidies by the year 2020. The ocean and and fishers whose livelihoods are dependent on a healthy and productive ocean cannot further wait for strong collective action that will put a halt to the ongoing destruction of jobs and natural resources. During the WTO Public Forum held at the WTO Headquarters in Geneva, BLOOM and the Varda Group organized a session on public subsidies in collaboration with our partner the International Centre for Trade and Sustainable Development (ICTSD). Seven proposals by groups of Member States were tabled throughout the summer 2017. BLOOM and The Varda Group, which advocate together for a legally-binding decision on harmful subsidies, have analyzed the proposals. 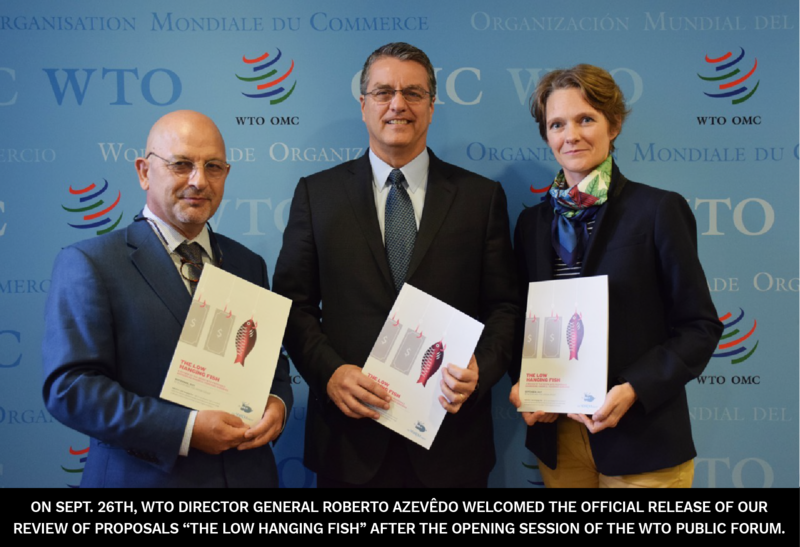 Our report “The Low Hanging Fish” was formally handed to WTO’s DG Roberto Azevedo on Sept. 26th at the opening of the WTO Public Forum. Transparency: cornerstone of optimal management of fisheries resources. 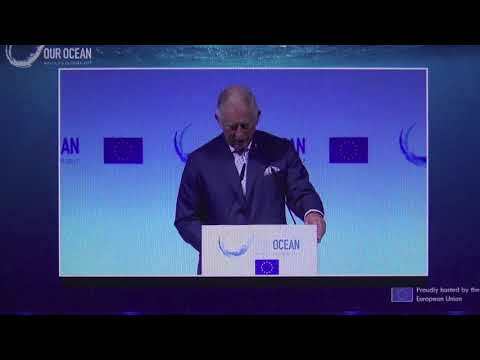 On October 5, 2017, during the opening session of “Our Ocean” Conference in Malta, His Royal Highness the Prince of Wales delivered a powerful address about harmful subsidies and SDG 14. The Prince of Wales mentioned how encouraged he was by the World Trade Organization’s progress on the issue of fisheries subsidies. The WTO has been discussing fisheries subsidies for the past 17 years. 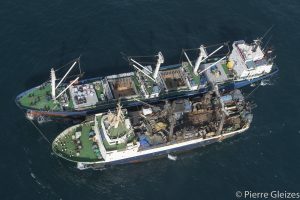 Scholars estimate that subsidies that contribute to overcapacity, overfishing and illegal fishing amount to USD18 billion every year. 23 October 2017 – Can the WTO bridge obstacles? 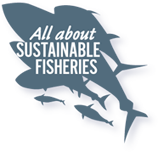 Towards a WTO Fisheries Agreement that is environmentally and socially sustainable? Seven weeks to go before the WTO Ministerial conference (MC11) starts in Buenos Aires. Expectation for a fisheries subsidies agreement is growing, but obstacles remain. Will the WTO Members finally agree, and with what level of ambition? 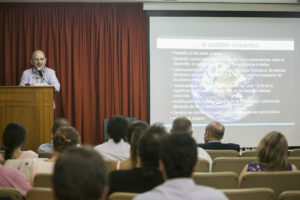 On December 7, 2017, BLOOM and the Varda Group participated to the conference “SDG 14: Health of the Ocean” organized by the Fundacion Vida Silvestre, the USAL (Universidad del Salvador) and the APrA (Agencia de Proteccion Ambiental). Two days before the official beginning of the WTO Ministerial Conference, BLOOM and the Varda Group met with the argentinian green MP Juan Carlos Villalonga. On December 9, 2017, just the day before the WTO Ministerial Conference fish subsidies talks start, BLOOM and the Varda Group published an analysis of the Draft negotiating text to understand opportunities and threats. Download here our recommendations. 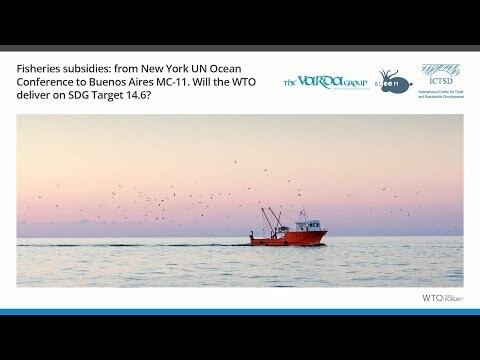 BLOOM and the Varda Group organized a session untitled “Elimination of fisheries subsidies: MC 11’s Low Hanging Fish” at the Trade and Sustainable Development Symposium organized by ICTSD. 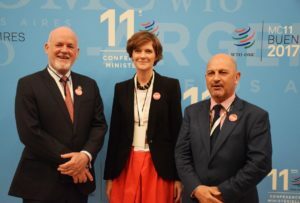 On December 11, 2017, The Low Hanging Fish Campaign was with UNSG’s Special Envoy for the Ocean Peter Thomson, who has high hopes that 164 WTO Members agree on an ambitious agreement on fisheries subsidies. He highlighted that a deal is now the only way to implement SDG14.6 in time for 2020 deadline. 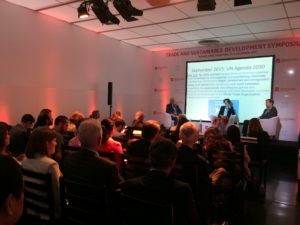 On December 13, 2017, Claire Nouvian participated to a second session on fisheries subsidies at the Trade and Sustainable Development Symposium. 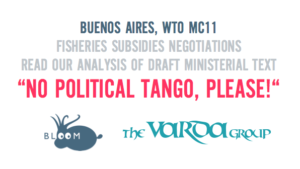 Official WTO statement – BLOOM and the Varda Group, which have been advocating for the adoption of strong fisheries subsidies disciplines at the WTO 11th Ministerial Conference, are dismayed by the WTO’s failure to agree on a binding agreement. > Read our press release.